U.S. BILL SEEKS FIRST NATIVE AMERICAN LAND GRAB IN 100 YEAARS | "Global Possibilities"
Two U.S. congresspeople will propose in the coming weeks a bill that would see thousands of acres of Indigenous lands turned into oil drilling zones. Two Republican congresspeople are seeking to pass a controversial bill through the U.S. House of Representatives that would seek the first land grab of Native American lands in 100 years, members of the Ute nation have warned. The Utah Public Lands Initiative was proposed by Utah Congressperson Rob Bishop and Jason Chaffetz and seeks to “roll back federal policy to the late 1800s when Indian lands and resources were taken from tribal nations for the benefit of others,” the Ute Business Committee said in an article for the Salt Lake Tribune Saturday. Bishop and Chaffetz will present the bill to the House in a few weeks, and if it passes it would see 18 million acres of public lands in Eastern Utah downgraded from protected lands and turned into oil and gas drilling zones that are exempted from environmental protections, Think Progress reported earlier this year when the bill was unveiled. The bill proposes to make more than 100,000 acres of the Ute reservation lands for the state of Utah. “This modern day Indian land grab cannot be allowed to stand,” the committee argued. The nation further slammed the legislators for utterly failing to consult and work with leaders of the Native American community in drafting such a bill when it proposes taking away more than 26 percent of its lands. “Representing more than a quarter of these eastern Utah lands, the tribe should have been a major participant in the development of any bill to address problems in federal land management. We were not,” the committee warned in their article. 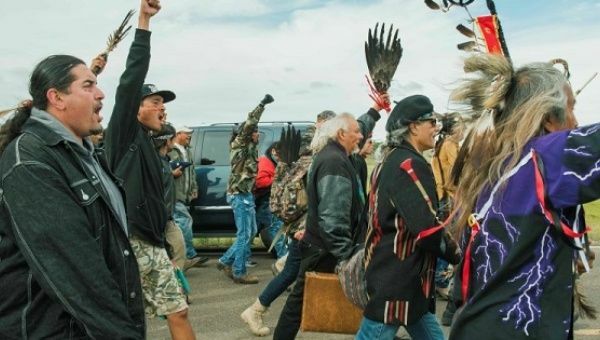 The news comes as more than 100 Indigenous groups have been organizing major mobilizations against the Dakota Access Pipeline which sparked a wave of international solidarity. The US$3.8 billion pipeline would carry shale from the Bakken oil region in North Dakota to oil refineries on the Gulf Coast.